Getting a personalized number plate has always been in questionable taste. In films and television dramas, bespoke plates are often used to hint that a character is a bit of a show-off or desperate for attention. But the Driver and Vehicle Licensing Agency (DVLA) has decided that there is no doubt about the taste of certain number plates. Censors at the government body that hands out number plates has banned hundreds of personalized registrations because they are seen as in bad taste. The DVLA’s ‘propriety committee’ has withheld plates with letter and number combinations that spell out words such as ‘arse’, ‘bonk’, ‘bum’, ‘drugs’ and ‘slags’. The group meets twice a year to vet potentially offensive registration numbers before they are released in March and September. It looks at the sequences of numbers and letters to be used on plates to check if any appear to spell out words they deem inappropriate. Plates including SH12 EDD, BO11 CKS and anything ending with KOK have been banned according to lists released under the Freedom of Information Act. Also censored are *S** HAG, TW** AAT and UP** YOU, where the stars denote different combinations of other numbers and letters. Drivers are not able to get their hands on BL08 JOB, 51 LUT, BB11 TCH, K11 LLA and BU62 GER. The DVLA has also stopped plates with racist or extremist overtones, such as DA** RKY, MU11 AHS and Y11 DOS. Insults popular with young people including SP**AZZ and M0**NGS, which are offensive terms for someone with a learning disability, have also not been allowed. Currently number plates that end in the common text message abbreviations OMG and WTF are still allowed, but the DVLA said that these too may soon be added to the banned list. A spokesman for the DVLA said: ‘The vast majority of registration numbers are made available but we have a responsibility to ensure that the combinations used do not cause offence. 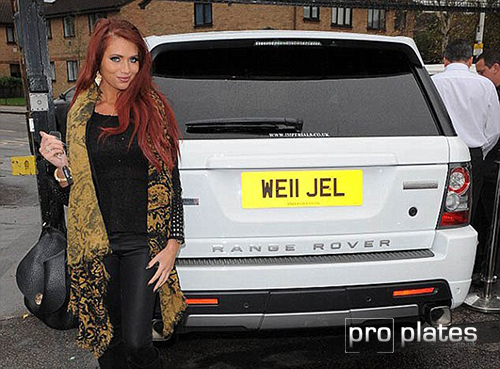 Last year the DVLA raised £67m from the sale of personalized number plates. The highest ever price paid for a plate sold by the DVLA in the UK was £352,000 for plate 1 D in March 2009. Other expensive plates sold by the body include 51 NGH, which sold for £254,000, 1 RH, £247,000, and K1 NGS, £231,000. Lord Alan Sugar uses the numberplate AMS 1, which is based on his initials. The Duke and Duchess of Cambridge drove away from their wedding with one that read JU5T WED. Since 2001, the third and fourth digits on a British number plate identify the age of a car and change every six months – the current number is 13 and will be 63 from September. The first two letters denote the area where the car was registered and the final three letters are random.